Autumn is in full swing! While there is not one chorus of yellow, orange, and red singing in unison across the mountainside like other years, all of nature is now is in the chorus. I’ve been tracking this Aspen tree sitting in the front yard since I got here. Each day its voice would be just a little bit louder amongst the brown and blue backdrop. Today that tree sang its solo. 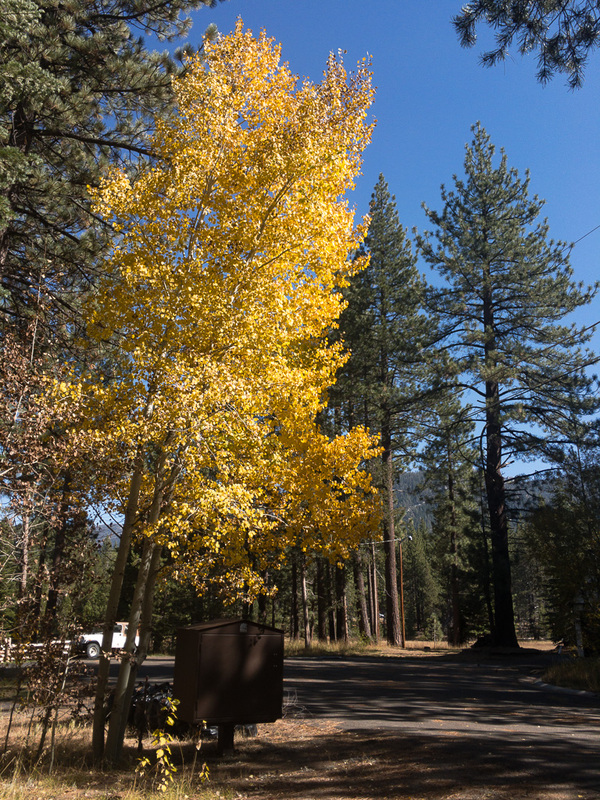 Bishop Creek Canyon and the Hope Valley are my two favorite spaces in California to find fall color. What’s unique about the Hope Valley is that it’s all unapologetically yellow. The aspens sing out across the mountainside spreading color so unique to the season. Of any place of any topic on my blog – this one comes up the most regularly. In many ways, it’s my home away from home. While thinking about this blog, the song Fields of Gold by Sting clearly came to mind. While I know this rendition isn’t done by Sting, I love it. The harmonies and the videography really resonate with me. Tyler truly is an artist here. Doing a bit of research, a quote by Sting about the song reminded me of my time up in the mountains. There’s something about the openness here that truly speaks to me. Most of my rides have been late in the day generally getting chased off by the impending cold brought on by the night. It’s not the soft cooling we see in the bay area when evening comes. It’s an unapologetic temperature snap plummeting to below freezing even though the daytime highs were well into the 60s. In many ways, I’m trying to discern what the trees are trying to say. I thought often riding around these parts what exactly the autumn means. In one thread, I feel like the trees are making one final stand climaxing the glory of their growth cycle. They stand out like a no other feature as spots of concentrated color dotted across the landscape but only for a blink of an eye. In a different vein it seems like the trees are fighting against the slow, but inevitable draining of the life inside of them. With each day the chlorophyll that gives the leaves life seeps away little by little. A green, healthy leaf slowly slips into a colorful state. But the irony of the color is that it’s not a sign of growth and beauty, but a sign of death. In many ways it makes the aging process beautiful. It’s the one season in a tree’s cycle that it is truly beautiful. But alas that leaf will turn brown and fall soon decomposing into the nutrients that tree needs to grow next season. I love each of the lakes that adorn this Sierra Highway. Caples Lake is my favorite. Its waters are always a deep blue surrounded by snowcapped mountains even in the late fall. It’s the epitome of alpine lakes. The highway crosses the dam holding this body of water together with a beautiful view of the mountains above and the valley below. Carson Pass isn’t the highest by any stretch in California but what it lacks for in height makes up for in accessibility. Carson remains open all year. In the winter time, it’s a beautiful view heading east seeing all of the Hope Valley and Red Lake blanketed in snow. Unfortunately, that isn’t the time now but the signs are all there that winter isn’t far off. The ranger station is closed and the evening chill is starting to work its way through my suit pushing me home. Winter is coming. The heated gear pigtail is out for the season and Navigon is listing winter speed limits. Brr! But in each moment, I’m continually reminded that I’m glad to be here. Nice roads! We know Hope Valley well, stayed at Sorensens a bunch of times. Next time take a right on 88 to Markleeville and head to Grover Hot Springs for a dip in their large hot spring pool! Lots of people to meet, fun!